If you love spending time in the great outdoors, you might worry about the dangers of wildlife and natural disasters. However, you might not worry too much about cold weather, especially if you prefer camping in the warmer months of the year. The Farmer’s Almanac explains that more people die from hypothermia in the summer than in the winter. 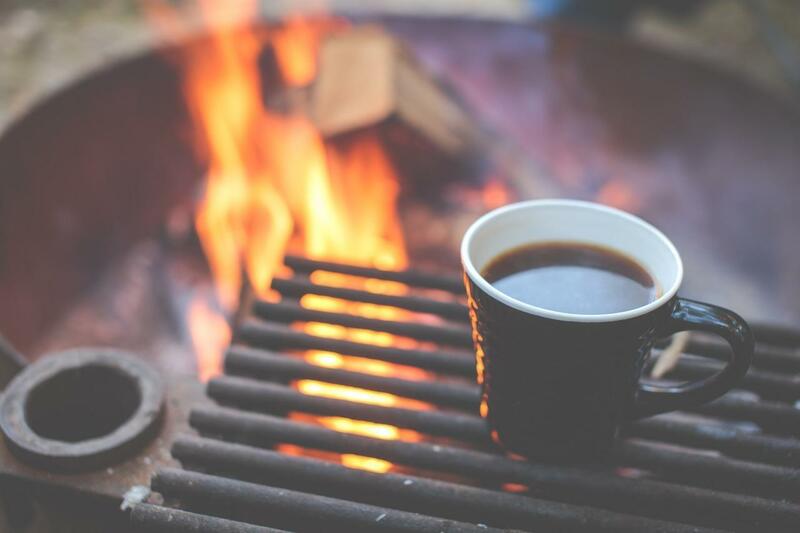 No matter when you go camping, you should understand how heat loss happens so that you can stay safe and warm in any conditions. It’s important to understand that if we didn’t have mechanisms to lose heat to the environment, we would overheat every time we exerted ourselves. It’s important to keep our temperature balanced. The ideal situation would occur when the amount of extra heat that we produce is equal to the amount that we lose to our surroundings. Princeton University’s Outdoor Action Guide to Hypothermia and Cold Weather Injuries says that we lose heat to the environment in four ways. According to WebMD, we lose 65 percent of our body heat through radiation. Radiation is the transmission of electromagnetic waves through space. As long as we’re alive, we naturally heat our bodies to an average temperature of 98.6 degrees Fahrenheit. That’s usually warmer than the environment that surrounds us. Our body tries to equalize the temperature, and we give off heat, displacing it to the cooler area. This can happen whether or not we’re wet or dry. We lose heat via radiation even when there’s no wind or cool breeze blowing on us. The more surface area is exposed to cooler air, the more heat we lose. Hypothermia sets in when the core body temperature drops to 95 degrees. When you come into direct contact with a surface that’s colder than your body, you lose heat via conduction. Instead of transferring heat to the environment, you move it into the cooler object. Conduction explains why your hand becomes cold to the touch after you’ve been holding onto a metal pole. If you’re camping, you can lose heat to any surface on which you’re sitting or lying. If you don’t insulate yourself, you’ll get cold when you’re lying on the chilly ground. You’ll be uncomfortable even when you’re sitting on a rock or picnic bench. Conduction happens even faster when you’re in water. According to Prepping to Survive, you lose heat approximately 30 times quicker if you’re submerged. That explains why 70-degree water feels so much colder than 70-degree air. Convection involves losing heat to the environment. However, it requires some air movement to occur. Convection explains why you can cool yourself off while sitting in front of a fan. The circulating air touches your skin. As it does so, it takes away some of your heat. As more cool air brushes by your body, you lose additional heat. This explains why it’s so important to shield yourself from windy conditions. When you increase your core temperature, you sweat in order to keep your body cool. This is a built-in mechanism that prevents you from overheating. As the moisture evaporates, it cools the surface on which it’s sitting. If your skin is wet, it can be tough to stay warm. Although sweating can be dangerous when you’re camping in cooler weather, so can moisture of any kind on your skin. If you’re exposed to rain, snow or mist, you could be in danger of losing body heat. When you inhale cold air, your lungs absorb oxygen. You exhale carbon dioxide. However, you also breathe out the air that your body has warmed up. Your temperature experiences a dip when this happens. Compared with the amount of heat that you lose through the other mechanisms, heat loss through respiration is fairly minor. However, it can be a significant factor when you’re spending time outdoors in cool weather. Losing heat via respiration is also a concern while you’re sleeping. You lose about 25 percent of your body heat while you’re sleeping, according to Trail Sherpa. While you sleep, your natural metabolism is keeping your core temperature at a safe level. If you lose heat via any of the mechanisms described above, you’ll create an imbalance and get cold. You need some type of thermal insulation to prevent this from happening. It seems obvious that a sleeping bag will keep you warm while camping. However, certain kinds work better than others for preventing heat loss. 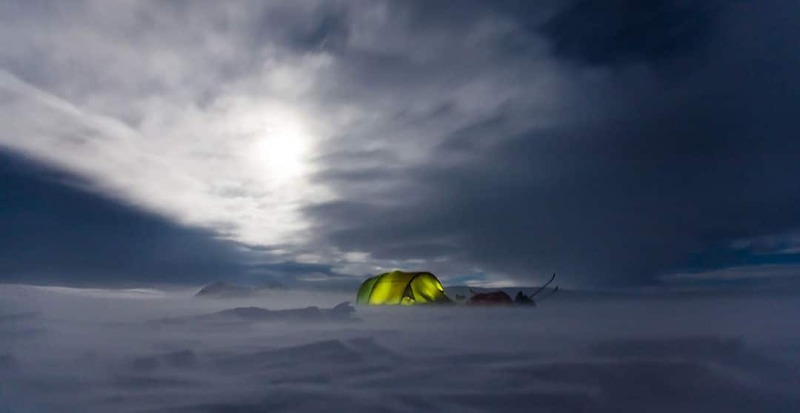 There’s a science behind sleeping bag construction that can save your life in cold weather. The goal of a sleeping bag is to trap dead air around your body. 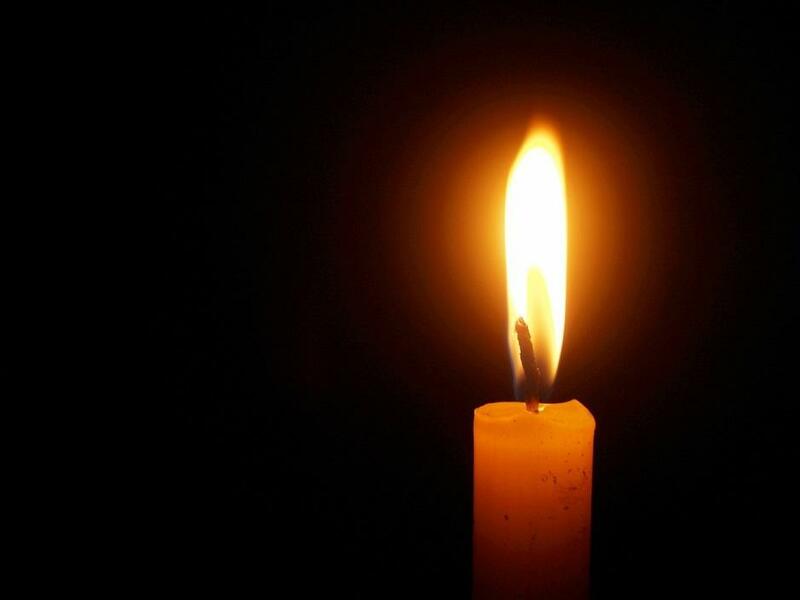 Your body heats the trapped air through conduction and radiation. As the air within your sleeping bag warms up, your body doesn’t have to produce as much heat to maintain a balance. Air doesn’t conduct heat very well. Therefore, the warmed air helps to insulate you and keep you warm. The sleeping bag material also prevents heat loss through conduction. That’s not its primary function, though. Its main purpose is to hold in the air. The sleeping bag shell and filling should be thick and dense enough to prevent the warm air from seeping out. If the fill material gets compressed under your body and moves to the side, you’ll lose air underneath your body. 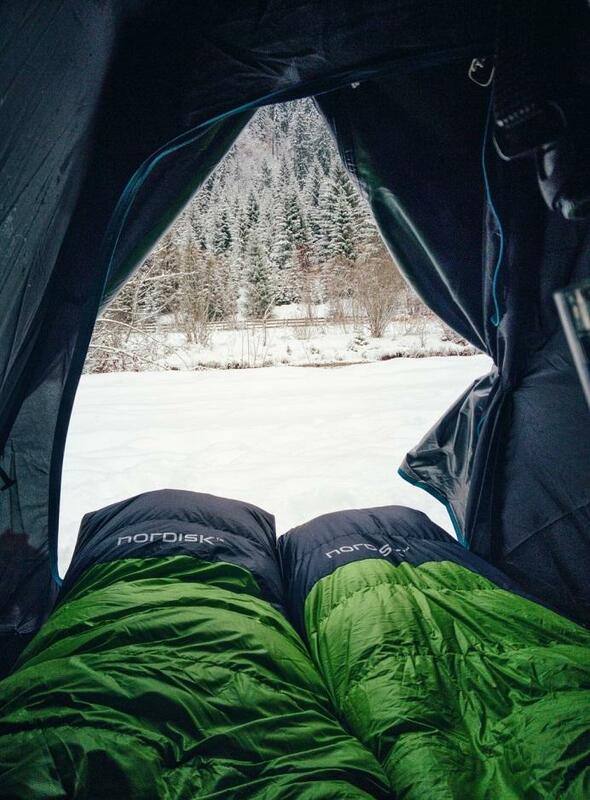 Sleeping bags that are made of dense material and have added fill in high-compression areas should keep you warm. Mummy bags are tapered and have less space for your body to heat. Look for other details that will help air stay inside the bag, such as overlapping layers at the seams, draft tubes around the zippers and insulated neck baffles. Drawstrings around the neck and face areas also prevent warm air from escaping. Many sleeping bags are marketed with specific temperature ratings. If your bag is rated -10 degrees, it doesn’t mean that you’ll be comfortable if the air drops to that temperature. It will keep you alive, though. If you want to be comfortable, you should use a sleeping bag that is rated 20 to 25 degrees cooler than you expect the air temperature to be. Cold ground is much more dangerous than cold air. If the ground is colder than your body, it will continue to pull body heat away from you in an effort to maintain equilibrium. Unfortunately, the process is never-ending. The ground will reduce your temperature until you’re as cold as it is. Even if you’re camping in the summer, when the air temperature is 85 during the day and 70 at night, the soil temperature might hover around 75. That’s more than 20 degrees lower than your ideal body temperature. Even if you have a thick sleeping bag, it will get compressed underneath your body. That’s why you need to rest on a sleeping pad even in warm weather. Sleeping pads may be inflatable. These can get a little chilly overnight. As the air outside cools down, so will the air inside the sleeping pad. If you’re using a traditional air mattress, you might feel even colder than if you’re on a thin sleeping pad. You might want to add a layer of felt or foam in between the air pad and your sleeping pad to prevent heat loss. Foam sleeping pads prevent heat from transferring from your body into the ground. Sleeping mats have an R-value, which indicates their level of insulation. The higher the R-value, the better the pad will protect you in the cold. If the pad is shorter than your height, you might want to rest your feet on a blanket or your pack. Tents protect you from the elements. Although the air inside your tent won’t be all that warm, it will be still, keeping you from losing heat through convection. A tent should also keep you dry. Keep in mind that a tent is not an insulator. It won’t help you retain the heat that you might lose through radiation and conduction. You need a sleeping bag and pad for that. Although a tent should prevent you from getting wet, it won’t stop you from losing heat through evaporation if you’re already damp. Never sleep in wet clothing, and make sure that you’re not dressed so warmly that you sweat through your layers. It can be tempting to grab your thickest layers to keep you warm while camping. It’s best to wear many thin layers, though. You’ll be able to regulate your insulation better, removing or adding clothing as necessary. 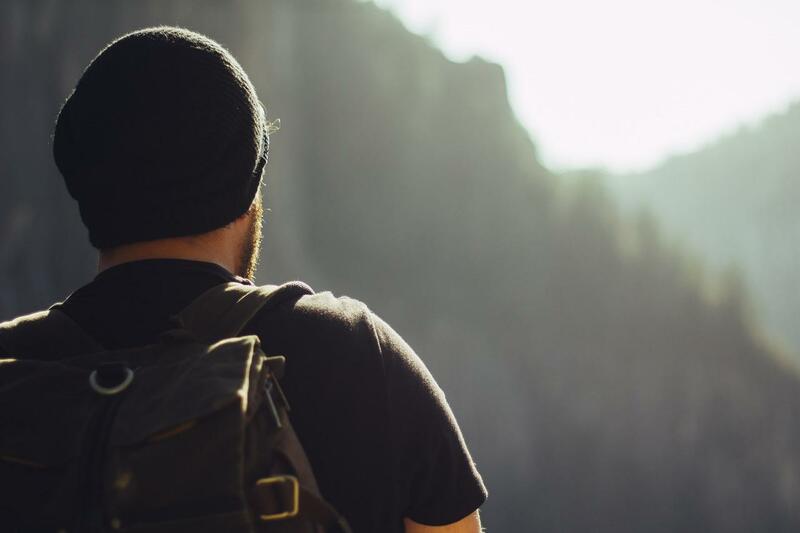 Loose-fitting clothing creates an air barrier, which acts much like the air inside your sleeping bag to insulate you. Don’t dress so warmly that you sweat underneath your clothing. You need to stay dry. Wool and moisture-wicking synthetics draw wetness away from your skin. Stay away from cotton, which stays moist and holds dampness against you. Cotton loses its insulating properties when it’s wet. Remember this rule when you’re looking for socks. Speaking of footwear, you’ll need to strike a balance when it comes to waterproofing and losing heat through evaporation. You should wear shoes that won’t soak up water if it rains. However, a water-tight seal might also make your feet perspire. Make sure that you change your socks frequently if your feet sweat. You might have heard that you lose most of your body heat through your head. That’s not true, says Live Science. Still, wearing a hat, mittens, scarf and face masks covers more of the skin’s surface area, preventing heat loss from radiation. Staying warm while you’re camping isn’t all about your gear. You can take action to prevent heat loss in many situations. Warming yourself up before you get in your sleeping bag can help you warm the trapped air better. You don’t want to get so hot that you’re covered in a layer of perspiration. Ten or twenty jumping jacks should do the trick. Once you have zipped up the bag, you should remove extra layers of clothing, allowing your body heat to transfer to the air. You should take a few precautions to make sure that your tent protects you as effectively as possible. Don’t set it up in a low spot on the ground. A flat area that’s only a few inches lower than the rest of the land will collect water in a rainstorm. Place a tarp under your tent to protect it from moisture. Just make sure that the edges of the tarp don’t extend past the sides of the tent. Otherwise, it will act as a water collector if it rains. The moisture will end up between the tarp and the tent instead of the tarp and the ground, where you want it to stay. It can be surprising to wake up to cold water dripping on you as you’re sleeping in your tent. Condensation from your breath can build up on the walls of your tent as you sleep. This can be dangerous, especially if the weather is cold. It may seem counterintuitive to vent your tent, but air circulation is necessary to prevent condensation. Keep a window or door open, or make sure that you set up your rain fly properly so that it allows for adequate airflow. You might not be able to imagine sleeping outdoors without a campfire. However, a roaring fire isn’t always appropriate. They’re prohibited in some areas, and they won’t keep you warm while you’re in your tent. 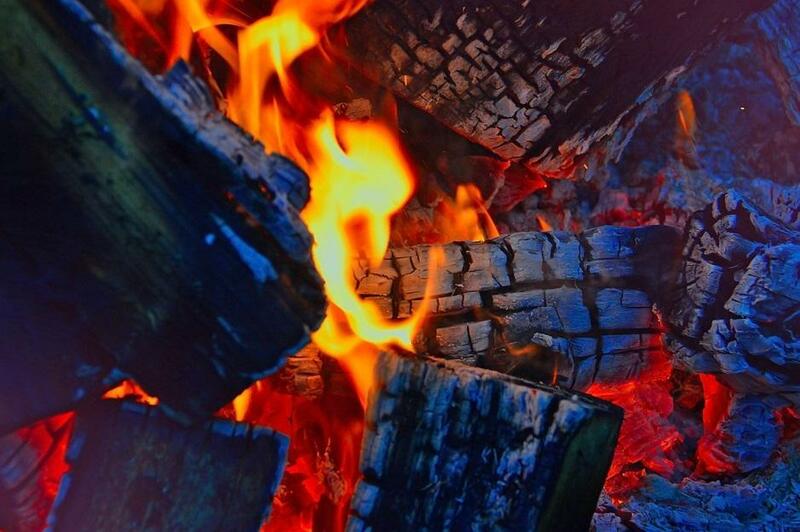 Some say that if you can feel the warmth of a campfire, you can also lose heat to the environment. Therefore, you might want to dress warmer to insulate your body instead of relying on a blaze for heat. Still, the toasty flames can provide a welcome relief from the biting cold on your nose. Don’t wait until you’re freezing to take action. Use the right gear and follow these tips to prevent you from losing body heat.